Glycolic acid benefits the skin, acting as an exfoliating medium by dissolving the internal cellular cement, which contributes to abnormal keratinization and allows for the sloughing of dead skin cells. The glycolic acid used in Essentials by Catalina products is produced using a novel acid saponification and purification process that is free of formaldehyde, unlike traditional production methods. Glycolic acid falls under the category of Alpha Hydroxy Acids, also referred as an AHA. AHA-containing products cause removal of dead skin cell build up, or shedding of the surface skin (Source 1). In other words, it brings fresh new skin to the surface. Traditionally, glycolic acid was used in high concentrations of around 30 percent in chemical face peels that could only be performed in a dermatologist’s office. Essentials by Catalina has created a milder, simple product that you can use at home. 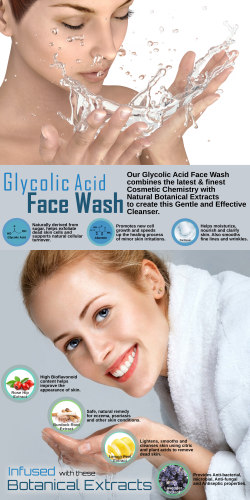 Our Glycolic Acid Face Wash contains 3% glycolic acid, a gentle yet effective ratio we found perfect for use on your face. The chemical exfoliation process removes dead skin, revealing bright, new skin cells. This promotes a clearer complexion and healthier looking skin, with many of my fellow co-workers willing to vouch for it’s effectiveness. 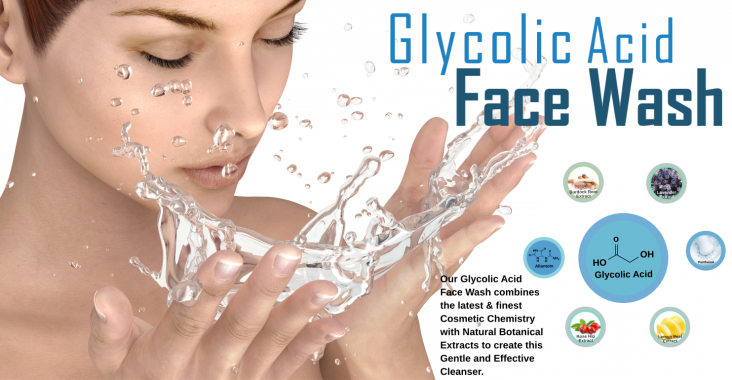 Glycolic acid is the simplest of all AHAs and is believed to have the greatest penetration potential, attributed to its smaller molecular weight. Glycolic acid aids in keeping pores clear of excess keratinocytes (cells that make keratin) making it a great ingredient for those with skin discoloration, dead skin build up, blackhead prone skin, and signs of aging. It is especially beneficial for those who want to correct dull looking skin. Definitely consider sun protection after using a glycolic acid, or AHA product. Using sunscreen or protective clothing after using these types of products is very important. The fresh new skin cells brought to the surface may be sensitive to sunlight.